Steven Soderbergh’s latest film appears at the tail end of a meteorically successful period for the American director. After committing to a gruelling schedule that has seen him direct a staggering five movies in under three years, produce five more and pick up a brace of Academy Awards, it is not surprising that Soderbergh has confessed his desire to have a rest in 2003 (despite this, rumours surrounding his latest film; The Informant, suggest that it is already in production). With Solaris, Soderbergh has reiterated his apparent desire to tackle every cinematic genre and sub-division almost simultaneously, this time, by making a science fiction movie. An old straight forward tale of loss and redemption set in the complex environment of space, Solaris already possesses a diverse cinematic history; based on the novel by Stanislaw Lem, it was first committed to film in 1972 by venerated Soviet director Andrei Tarkovsky. His interpretation of the novel was awash with profound ideas and imagery, enclosed in a rather loose and at times, painfully slow narrative. So it really begs the question: Why remake it? Soderbergh has seen fit to adapt material that would appear to have little chance of success in Hollywood Mainstream Cinema, and has transferred it directly, and I have to say, quite faithfully. Now we all know that he is riding high at the moment, the workaholic golden child, the director capable of making films with a modicum of complexity and intelligence that also break out big at the box office. Naturally, all of Soderbergh’s myriad cinematic talents were brought to bear on Solaris and unfortunately the result leaves the viewer slightly deflated. Solaris opens on a rain sodden Earth somewhere in the near future, where we are confronted with Psychologist Chris Kelvin (George Clooney) and his empty existence. We don’t have flying cars yet, but Kelvin’s high-tech kitchen and slinky office apparatus remind us that we are in fact watching science fiction and not Clooney’s transfer from the ER to the psychiatric ward. Soderbergh keeps the exposition in the opening reel to the barest minimum. Kelvin receives a communiqué from his old friend Professor Gibarian (Ulrich Tukur), who is the commander of a space expedition to the remote, titular planet. He requests Kelvin’s help in unravelling the mysteries within which he and his crew have become embroiled since they have been orbiting the world, and Kelvin accepts. In these opening scenes only Clooney is ever captured in focus, bodies flow around him but they are fuzzy outlines, blurred and undefined. Even the two men who come to Kelvin’s apartment to alert him of the interstellar urgency of his mission, are indiscriminate. All we are shown is Chris Kelvin and his solitary existence, floating amongst ghosts. The visual impact of Kelvin’s arrival onto the spacecraft surrounding Solaris dramatically relocates the action into the science fiction realm. The docking sequence is highly reminiscent of 2001 in the balletic elegance of movement between the two craft and the planet looming large in the background, pulsating with purple radiance. Suddenly the viewer is presented with a highly articulated environment in the best production design traditions of the science fiction genre. The sets are sparse, cold and mechanical. Clean metallic lines and shapes are combined with the typical non-essential computer screens chattering away with self-importance in the background. The futuristic visuals, whilst impressive and enjoyable (especially to fans of the genre) are hardly groundbreaking in their originality. The functionality of life in space and its apparent lack of social warmth and comfort is a common recurrence reflected in the set design of many of Solaris’ cinematic stable mates. Kelvin is quickly introduced to the surviving members of the crew. It soon transpires that his friend Gibarian has committed suicide prior to Kelvin’s arrival, and his fellow shipmates are heading in the same direction swiftly. Dr’s Gordon and Snow have definitely been in space too long! Kelvin begins to scratch away blindly at unmasking the mystery that Gibarian had alluded to in his communiqué: namely that each individual member of the crew is having a deeply personal response to their surroundings, seemingly brought on by their close proximity to the mysterious planet. They are unable to define or deal with what they are facing; are these apparitions that they see the product of their own dreams and memories or do they actually exist, as in if in some sort of Ad hoc afterlife. Once Kelvin is unsafely aboard the planet-orbiting ship the real enigmas begin to unfold and he begins to see visions of his own, predmominantly in the form of his dead wife. At this point the narrative begins crumbling away to reveal a closely observed character piece, only peppered with occasional interludes of plot-driven “excitement”. Kelvin begins to linger on the past, and how things might have been when presented with an apparently living and tangible (Kelvin tests this to the best of his abilities!) version of his wife Rheya (Natasha McElhone). It is in the unravelling of Kelvin and Rheya’s tragic, intermingled past through a series of flashbacks that Solaris registers its most satisfying accomplishments. These moments aspire to something way beyond mainstream cinema, they are immaculately shot, and at times extremely moving. Soderbergh’s characteristic “slickness” of lighting and camerawork mixes intoxicatingly with some clever dialogue (both grave and light-hearted). This is particularly apparent in the scene where Kelvin remembers the night they first met. The dark brown chiaroscuro shades and sexually charged banter are reminiscent of Soderbergh’s earlier Clooney collaboration; Out of Sight. Sadly the engaging love story that takes place again is punctuated with moments of unwanted interstellar plot interference as the survivors scratch around trying to find a “solution” that proves elusive. Kelvin is brought back to space with a bang. It is as if Soderbergh has to keep reminding himself that there is a goal driven narrative to pursue in between all the deep and meaningful moments surrounding Kelvin’s mental predicament. This is where Solaris really breaks down, it displays moments of genuine quality, particularly when Soderbergh has a free reign to explore Kelvin’s bitterness, regret and emotional frailty but these scenes never really come to fruition, and the result is somewhat precariously placed between straight science fiction and a romantic movie with intellectual aspirations. Soderbergh has tried really hard to be profound, attempting to deliver complexity through characterisation, and at times he nearly achieves this, but the end result is schizophrenic and unsatisfying. The structure is vague, the pacing is erratic (the conclusion is abrupt and predictable) and whilst there is an alluring period of interplay between Clooney and Natasha McElhone (Rheya) that stokes the fire of the films’ most impressive moments, the peripheral character’s are either sketchily drawn (Dr Gordon) or irritating (Dr Snow). In fact Jeremy Davies’ supporting role is totally baffling. He embodies’ a light hearted quirkiness that simply isn’t necessary, by sitting slouched in a chair or by gesticulating wildly and talking really slowly he attempts to give the impression that his brain has been addled by isolation and confinement. He succeeds only in proving that a clumsy performance is out of place in a film with such lofty philosophical aspirations. If the peripheral characters are badly rendered, the accompanying plot borrows distinctive snippets from science fiction classics of the past. So much for Soderbergh trying to take science fiction back to its roots, he takes visual cues from films such as Alien and 2001 (Clooney’s time-lapse space suit scene is reminiscent of the opening scene of Alien), but fails to attain the level of overall atmosphere and absorption present in such films. 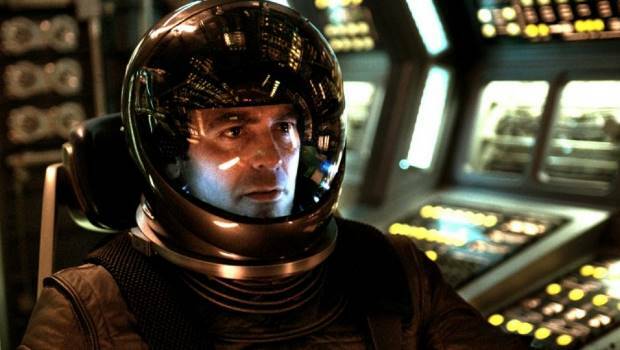 People will go to see Solaris to witness George Clooney in space (obviously a mouth-watering prospect for some!?) and despite a talented director’s best efforts, the majority will be disappointed with what they find him doing when he gets up there. I really wanted to like Solaris, but it offers very little, and will inevitably fall upon the barren ground in between commercial success and critical acclaim because it isn’t courageous enough in its execution to appeal strongly to members of either camp.